If you copy the admin theme or create a subtheme based off of the admin theme (note, this won't work with Drupal Commerce, as it already has a subtheme based off of Shiny) - and then add a css file via a .info call, you will load the CSS on every page. If you copy the admin theme, or create a subtheme based off of the admin theme, you can use the hook drupal_add_css() in your template.php file. This will allow you to call the stylesheet conditionally, on certain pages only for example, or for certain browsers. This works alright but you're already calling more files than necessary. Create a directory called 'mymodule' (use whatever name you want), create these files within it, and then place it within your sites/all/modules/custom directory. I've added comments to the code below so you can see what's happening. // Add conditional stylesheets for admin pages on admin theme. ...and then of course you add your own css to the mymodule.css file, being called last on the admin theme. 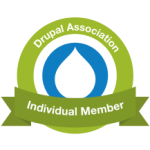 Learn more about function drupal_add_css here.